Most PMP exam prep books are organized by Knowledge Areas or Process Groups/Domains defined in the PMBOK Guide. Recently I came across PMP Rapid Review (by Sean Whitaker), which takes a unique approach. It is organized according to the PMP Exam Content Outline. This article is a review of this book. 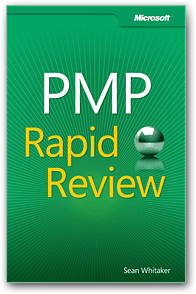 Most people think that the PMP exam is based on the PMBOK Guide. You might be shocked to hear that it’s not true. In reality, the PMP exam is based on the PMP Exam Content Outline, which is defined as a result of an elaborate Role Delineation Study (RDS) conducted by PMI. The content outline defines the performance domains (a broad category of duties and responsibilities that define the project manager’s role), as well as the tasks required for competent performance of the role and the knowledge/skills required to perform those tasks. The book is organized into 5 chapters - one for each Process Group/Domain (Initiating, Planning, Executing, Monitoring and Controlling, and Closing). Within each chapter, the content is organized by the tasks as specified in the PMP Exam Content Outline. Each section includes a summary of the task, a list of things you need to know for the exam, a few exam tips, and concludes with a list of about 5 questions that help you test your understanding of the task. As far as the task summary is concerned, you are unlikely to find anything that is not covered in any standard PMP exam prep guide. At the end of each chapter, there’s another set of 5 questions for each task covered in the chapter. None of the questions in the book are multiple choice questions (MCQ), the format used in the PMP exam. The questions are meant for self-assessment, and the answers are not provided. While the PMP Exam Content Outline specifies both Tasks, and Knowledge/Skills, this book only covers the Tasks. It does not cover the Knowledge/Skills portion of the content outline. The book is not a standalone study guide in itself. It's a companion to the in-depth PMP Training Kit. It is available in paperback and digital formats. The best part about the book is that it helps you to correlate the content of your favorite PMP exam prep guide with the official specifications of the PMP exam, and allows you to confirm that you have fully understood and covered all the bases for the exam. Overall, the book is exactly what it claims to be - a quick refresher and a checklist. Don’t expect it to be a study guide. It’s good to have, but not a must have for the PMP exam. I received a free digital version of this book from the publisher for review. I’m not affiliated with the author or publisher of the book and was not paid for the review.